Manning, Mary Lou Septimus, Edward J. Ashley, Elizabeth S. Dodds Cosgrove, Sara E. Fakih, Mohamad G. Schweon, Steve J. Myers, Frank E. and Moody, Julia A. 2018. Antimicrobial Stewardship and Infection Prevention—Leveraging the Synergy: A Position Paper Update. Infection Control & Hospital Epidemiology, Vol. 39, Issue. 04, p. 467. Parente, Diane M. and Morton, Jacob 2018. Role of the Pharmacist in Antimicrobial Stewardship. Medical Clinics of North America, Vol. 102, Issue. 5, p. 929. Manning, Mary Lou Septimus, Edward J. Ashley, Elizabeth S. Dodds Cosgrove, Sara E. Fakih, Mohamad G. Schweon, Steve J. Myers, Frank E. and Moody, Julia A. 2018. Antimicrobial stewardship and infection prevention—leveraging the synergy: A position paper update. American Journal of Infection Control, Vol. 46, Issue. 4, p. 364. Giuliano, Christopher A. Binienda, Juliann Kale-Pradhan, Pramodini B. and Fakih, Mohamad G. 2018. “I Never Would Have Caught That Before”: Pharmacist Perceptions of Using Clinical Decision Support for Antimicrobial Stewardship in the United States. Qualitative Health Research, Vol. 28, Issue. 5, p. 745. DiDiodato, Giulio and McAthur, Leslie 2017. Transition from a dedicated to a non-dedicated, ward-based pharmacist antimicrobial stewardship programme model in a non-academic hospital and its impact on length of stay of patients admitted with pneumonia: a prospective observational study. BMJ Open Quality, Vol. 6, Issue. 2, p. e000060. Moore, Thomas Dembry, Louise-Marie and Saag, Michael S 2017. Sunday in the Park with Infectious Disease: Workforce Mismatch in a Colorful Universe of Possibilities. The Journal of Infectious Diseases, Vol. 216, Issue. suppl_5, p. S581. Wiffen, Phil 2017. Pharmacists are the gatekeepers to the use of antimicrobials. European Journal of Hospital Pharmacy, Vol. 24, Issue. 6, p. 313. Klepser, Michael E. Dobson, Erica L. Pogue, Jason M. Labreche, Matthew J. Adams, Alex J. Gauthier, Timothy P. Turner, R. Brigg Su, Christy P. Jacobs, David M. and Suda, Katie J. 2017. A call to action for outpatient antibiotic stewardship. Journal of the American Pharmacists Association, Vol. 57, Issue. 4, p. 457. Address correspondence to Emily Heil, PharmD, 29 S. Greene St, Room 400, Baltimore, MD 21201 (eheil@umm.edu). Endorsed by the Society for Healthcare Epidemiology of America (SHEA) and the American College of Clinical Pharmacy (ACCP). 1. The Evolving Threat of Antimicrobial Resistance: Options for Action. Geneva, Switzerland: World Health Organization website. http://apps.who.int/iris/bitstream/10665/44812/1/9789241503181_eng.pdf. Published 2012. Accessed March 23, 2016. ISBN: 9789241503181. 2. National Action Plan for Combating Antibiotic Resistant Bacteria. White House website. https://www.whitehouse.gov/sites/default/files/docs/national_action_plan_for_combating_antibotic-resistant_bacteria.pdf. Published March 2015. Accessed June 13, 2015. 3. Core Elements of Hospital Antibiotic Stewardship Programs. Centers for Disease Control and Prevention website. http://www.cdc.gov/getsmart/healthcare/pdfs/core-elements.pdf. Published March 2014. Accessed June 13, 2015. 4. ASHP Statement on the Pharmacist’s Role in Antimicrobial Stewardship and Infection Prevention and Control. Am J Health-Syst Pharm 2010;67:575–577. 5. Pedersen, CA, Schenider, PJ. Scheckelhoff. ASHP National Survey of Pharmacy Practice in Hospital Settings: Dispensing and Administration—2014. Am J Health-Syst Pharm 2014;72:1119–1137. 6. Dellit, TH, Owens, RC, McGowan, JE, et al. Infectious Diseases Society of America and the Society for Healthcare Epidemiology of America guidelines for developing an institutional program to enhance antimicrobial stewardship. Clin Infect Dis 2007;44:159–177. 7. Ernst, EJ, Klepser, ME, Bosso, JA, et al. 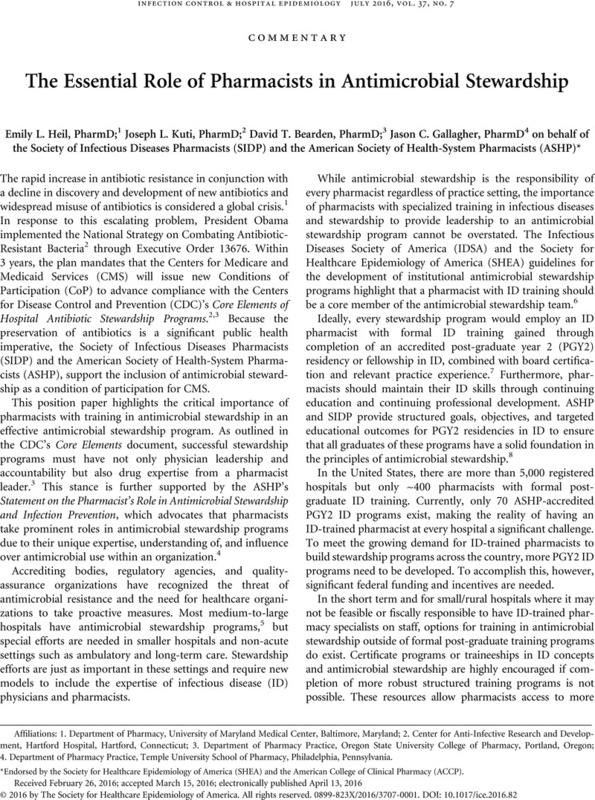 Recommendations for training and certification for pharmacists practicing, mentoring, and educating in infectious diseases pharmacotherapy. Joint Opinion of the Infectious Diseases Pharmacists and the Infectious Diseases Practice and Research Network of the American College of Clinical Pharmacy. Pharmacotherapy 2009;29:482–488. 8. Required and Elective Educational Outcomes, Goals, Objectives and Instructional Objectives for Post-Graduate Year Two (PGY2) Pharmacy Residency in Infectious Diseases, 2007. American Society of Health-System Pharmacists, Society of Infectious Diseases Pharmacists website. http://www.ashp.org/menu/Residency/ResidencyAccreditation. Published 2007. Accessed June 13, 2015.